The newest event on Tamahii Nations toy show circuit, Tamashii Comic-Con, is currently happening this weekend. While the show seems primarily geared towards some more mainstream non-toku properties like Stars Wars, Marvel, DC, and even the newly announced Harry Potter license, there are going to be a handful of new and upcoming releases relevant to us as well. First up, Bandai Tamashii Nations has on display the 2nd release in their Pacific Rim Soul of Chogokin line, Crimson Typhoon! You may recall, we saw this figure first back at Toy Fair 2018. This is our first solid look at it since then, and it looks absolutely incredible. These new images come courtesy of Amiami Hobby News, and while the placard seen in them doesn’t confirm any release information, we can only assume that such info will drop in the near future. We’ll keep you up to date with any other new reveals or upcoming releases that are at Tamashii Comic-Con through out the weekend. Last month we took you on a tour of all things Pacific Rim Uprising with a complete look at the line of Robot Spirits figures produced for the film from Tamashii Nations. 6 solid releases, each with it’s own strengths and weaknesses. Gipsy Avenger, Obsidian Fury, Titan Redeemer & Bracer Phoenix, and Guardian Bravo & Saber Athena. 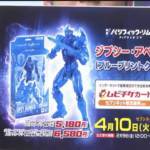 Now, we get to add an extra step on that journey with a look a this recent 7-11 Japan Exclusive release, Robot Spirits Gipsy Avenger Clear Blueprint Version! Blueprint Gipsy Avenger takes a mold we’re very familiar with at this point, an excellent one at that, and recasts the entire thing in gorgeous translucent blue with ice blue accents. Physically the figure functions entirely the same way, but it’s astounding how different and good it can look in these new colors. Equipped with the same Gravity Sling and Chain Sword as the original release, Blueprint Gipsy is a fantastic exclusive that may not be for everyone, but if you love this franchise, it’s a must own. We’ve put together just over 60 images of this beauty for your viewing pleasure. You can check out out the full gallery and review after the jump by clicking “Discuss on the TokuNation Forums” at the bottom of this post. Coming up soon we check out new releases from Kamen Rider Kabuto & Kamen Rider W! We’re rolling out the PPDC’s final two Jeagers in one double sized gallery today. Guardian Bravo embodies the bulky power of it’s predecessors and improves on the Gipsy series’ chain sword with it’s own unique weapon. Saber Athena meanwhile is the newest and fastest Jaeger in the fleet/ Built for agility and finesse, Athena is a remarkable close range fighter. Can these two next gen titans turn the tide of the war? We’ll see with their Robot Spirits figures! Both of these figures really stand out in the line. Guardian Bravo features a far brighter color scheme than any of the other Jaegers, and Saber Athena features vastly improved articulation and really unique proportions compared to the others. Bravo also comes with it’s signature Arc-16 Elec Whips while Athena comes with both of the Ionic Twin Blades as well as the larger Ionic Sword. For the last two figure we have to handle in this line (for now) they really are great ones to finish it on. We’ve got a full 80 image gallery of this pair (split across 3 posts) that you can see by clicking “Discuss on the TokuNation Forums” at the bottom of this post. Our next gallery after this will focus on the valiant knight Kamen Rider Brave Level 100! With a new apocalypse on the horizon in desperate need of cancelling, a new batch of pilots ready to make a difference, and hopefully a little bit of luck, the next generation of Jaegers are ready to roll out! While today’s subjects aren’t quite the latest models, they pack more than enough brute force to fight some Kaiju. Leading into Pacific Rim Uprising’s finale the mighty Titan Redeemer & Bracer Phoenix helped to shape Earth’s final defense. Now let’s see how these two latest Robot Spirits from Tamashii Nations fare in a double sized gallery! In a sense, Titan Redeemer & Bracer Phoenix are some of the most traditional designs in this film, and I find that really charming about them. Big bulky brutes that are ready to knock out some Kaiju. They may not have all the bells and whistles of other Jaegers like Gipsy Avenger, but these big guys along with their tiny included buddy Scrapper Jaeger are ready to cancel the 2nd apocalypse. Luckily for Earth kit-bashing is still popular in the future as well. So for the Final Battle we got to see a special combination of these two. And despite it not being a documented or even intended feature, these figures CAN pull it off! See the end of this gallery for a special look at Bracer Phoenix Final Battle Version! Check out just over 60 images of this pair by clicking “Discuss on the TokuNation Forums” at the bottom of this post. We have a full breakdown of both figures and their accessories, as well as an explanation of how to your own Final Battle Bracer Phoenix. We’ll be back soon with more brand new galleries from Pacific Rim Uprising as well as Kamen Riders Kabuto & Ex-Aid! In the years’ long war against the Precursors & their weapons of mass destruction, the Kaiju, the Pan Pacific Defense Corps has continued to develop newer and better Jaegers. And while a Drone program is also under development by Shao Industries to eventually replace the PPDC & it’s pilots, the occasional rogue element does arise. Enter: Obsidian Fury. A mysterious Jaeger which rose from the ocean to battle Gipsy Avenger. Equipped with advanced weaponry and capable of entirely inhuman movement, this monstrous mech is a force for our heroes to reckon with. Can Jake & Nate uncover the secret truth of Obsidian Fury? You’ll have to watch Pacific Rim Uprising to find out! Robot Spirits Obsidian Fury is one of several more entries in the Uprising line from Tamashii Nations, and it actually winds up being our only villain so far. A really quite alien design, Obsidian is a menacing Jaeger with some great glowing light piping in it’s head and a couple of bright neon orange Plasma Chainsaws to really sell its look. One of the more articulated figures in the line, Obsidian Fury is every bit as poseable, bestial, & alien as it’s background would imply. You can check out our full 60 image gallery of Obsidian Fury by clicking “Discuss on the TokuNation Forums” at the bottom of this post. 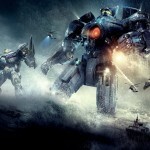 We’ll also be doubling up on our other upcoming Pacific Rim galleries in the near future, 2 Jeagers at a time! Titan Redeemer & Bracer Phoenix and Saber Athena & Guardian Bravo.